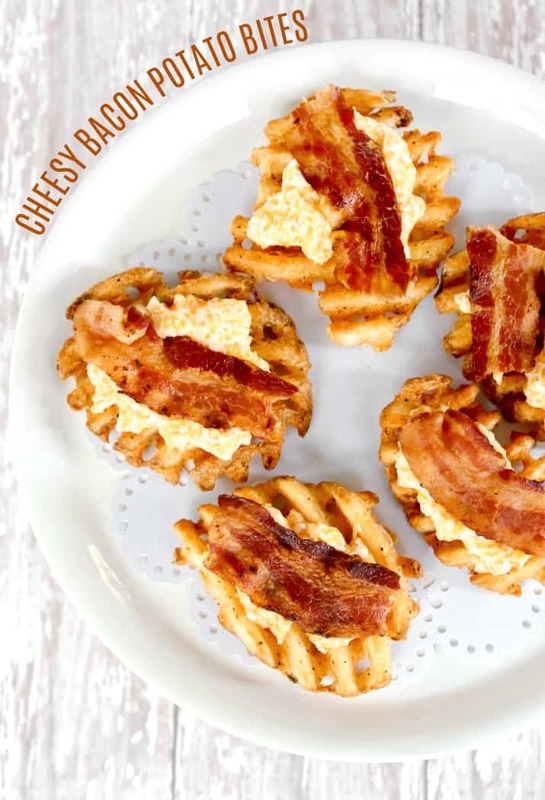 My Cheesy Bacon Potato Bites are delicious and easy party appetizers. Make these potato appetizers for casual entertaining at home, or as a tasty side dish for weeknight dinner. These are a crowd please’r if you’re looking for easy party appetizers for girls night in too. They start with convenient frozen waffle fries and only get better with the addition of cheese and bacon! These are a delicious Cheese party appetizer, but can be served as a side dish for dinner too. Appetizers are my FAVORITE food group! When hosting parties I’m usually serving an array of heavy hors d’oeuvres and cocktails. Even dinner parties include at least one special appetizer before the meal. This party recipe is one that continues to please everyone! Time is always a consideration. I love starting with packaged items for semi-homemade dishes. Frozen foods can make home entertaining so much easier. For my cheesy bacon potato bites I started with frozen waffle fries. These are typically a side dish item but I turned them into a delicious appetizer! These are sort of a spin on the classic potato skins you get at restaurants. These easy appetizers turned out so delicious. And the waffle fries are quite large so you get plenty of tasty goodness! Get my recipe below and make these for cocktail parties, ladies night, or happy hour. These bites are so versatile. They would make a great addition to a brunch buffet or this late night party buffet. After all, potatoes, bacon, and cheese are all staples of breakfast dishes. To help round out your appetizer party menu you might like to include these jerk-seasoned chicken skewers, these cute and practical veggie & dip bread cups, and smokey spicy pecans. These waffle fries are a terrific weeknight side dish to serve with dinner too. Both kids and adults love them! 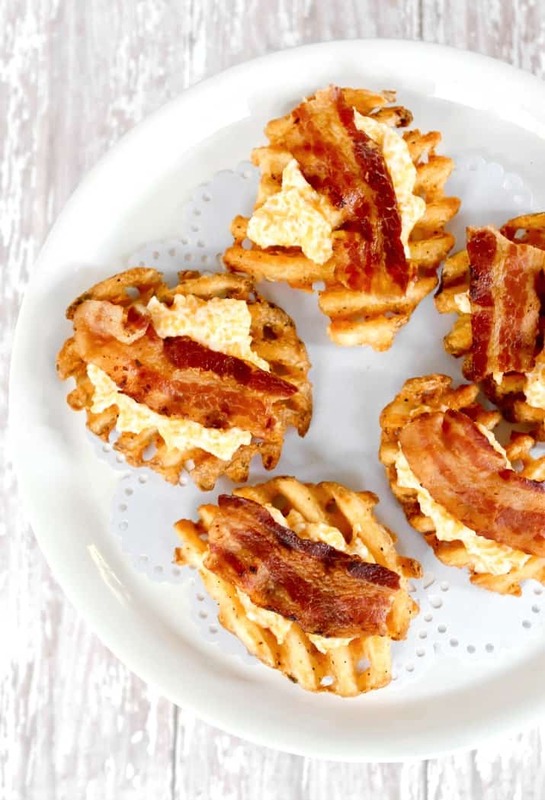 Another whimsical way to use waffle fries is in this burger & fries party food. 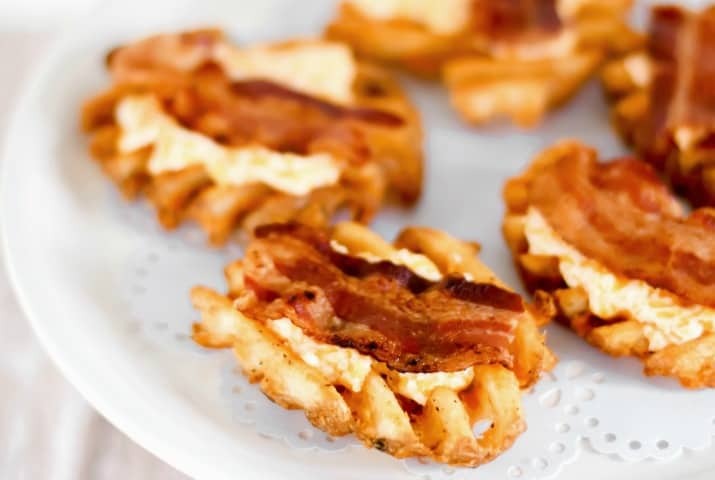 Turn waffle fries into an easy party appetizer. These cheesy bacon potato bites are so good your guests will beg for more! 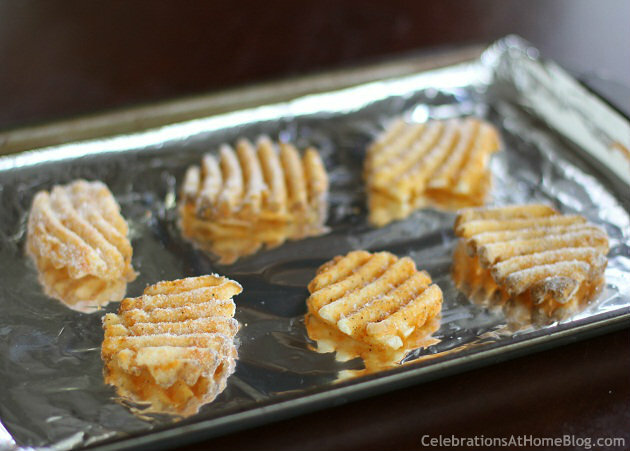 Preheat oven at 400 degrees, and lay frozen waffle fries in a single layer. Bake as directed on package. Combine cream cheese and shredded cheddar until well combined. If you need to add more of either cheese, you can do so. This is a very forgiving recipe. Once waffle fries are cooked, remove them and place a dollop of cheese mixture on top of fries. Return to oven at 350 degrees, for 3-5 minutes or until cheese is melted. Remove fries from oven and place a slice of bacon on top of the cheese so it adheres to the melted cheese. Serve warm, with sour cream on the side if desired. CAN YOU TELL ME HOW MANY THIS MAKES. ALSO, ANY IDEAS FOR APPETIZERS THAT ARE EASY FOR 40 PEOPLE. Carole, this was a small portion for 3-4 people. Increase the cream cheese to a full 8 oz block, and the cheddar to 4 cups for a crowd. Increase bacon as necessary. For a large group I always make a crockpot full of cocktail meatballs: https://celebrationsathomeblog.com/2013/05/bourbon-meatballs-and-bourbon-balls.html. Looks really yummy! Every bite should explode the good taste.